Fantastic Mr. Fox was originally a novel for children from author Roald Dahl. In 2009, it was made into an animated film for children. The film used stop motion animation, which makes it a very unique film that stands out from a sea of other animated movies. The movie follows our main character, Mr. Jack Fox. The actor George Clooney lent his voice talents to the main character. Mr. Jack Fox and his wife Felicity are almost caught in a fox trap in a raid that goes wrong. Felicity is pregnant, and she makes Jack promise to leave his life of crime behind so that he can get a respectable job that will be safer for him and their family. Mr. Fox decides to become a newspaper columnist, and he moves his wife, his rather odd-ball son Ash and himself into a better home in the base of a tree. Sadly, the location is not all that wonderful a place for foxes to live. However, Jack gives it a go. The nephew of Mr. Fox, Kristofferson, comes to live with the Fox family, and this drives Ash mad because his cousin is seemingly better than him at everything he does. It almost seems like Ash's dad prefers his accomplished cousin over his own son. Mr. Fox and friends end up doing a raid on a farm, and Mr. Fox's tail is shot off. The animals are pushed underground, and they tunnel into farms and rob them blind. Ash and Kristofferson try to get Jack's tail back, and Kristofferson is kidnapped. In the end, the day is saved by Ash, and all of the animals find a new home together. Fantastic Mr. Fox is currently available to watch and stream, buy on demand at Amazon, Vudu, Google Play, iTunes, YouTube VOD online. I gotta be honest. 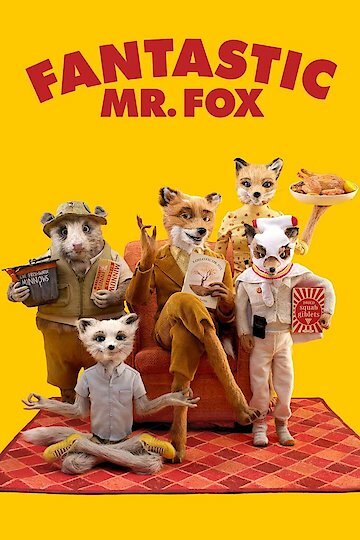 I thought "Fantastic Mr. Fox" was pretty genius and all, but I'm pretty eager to see another Wes Anderson film with, you know, real live actors and the like. So I was pleased as poop today to hear that Wes Anderson is moving forward apace with his latest film "Moonrise Kingdom," and putting a mammoth cast of top notch actors to work as we speak, including Bill Murray, Edward Norton, Tilda Swinton, Frances McDormand, Bruce Willis and Jason Schwartzman.